Login into IREPS application and click on Change Bidding Password link available on the right navigation block of logged in bidder's home page. Enter the old bidding password and new bidding password in the input boxes and click on the save button to save the new bidding password. After successful change of bidding Password you will get the message "Bidding Password have changed successfully". Login into IREPS application and click on Forgot Bidding Password link available on the right navigation block of logged in bidder's home page. Enter the new bidding password in the input boxes and click on the Sign & Submit button. 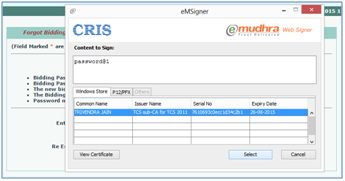 Choose the Digital Signature Certificate to Sign and click on Select button.